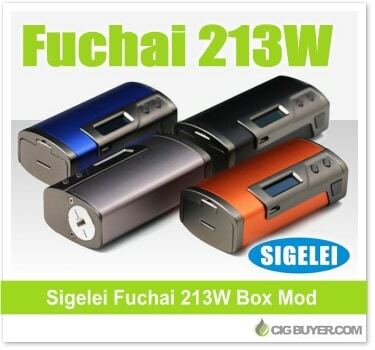 So it looks like Sigelei has come out with another 213W box mod. To be honest, we’re not sure what makes the Sigelei Fuchai 213W Mod different from the Sigelei 213 since they look virtually the same. And from what we can tell they have all of the same features, other than the carbon fiber skin on the standard 213W. Maybe this is why it has a higher price point, but both have the same great look and offer up to 213W of output with a super advanced feature set, including temperature control, preheat, TCR / TFR functionality and a 5 coil memory bank. Powered by dual 18650 batteries, it has a lockable sliding battery door, micro-USB charging (and update) port and spring-loaded 510.